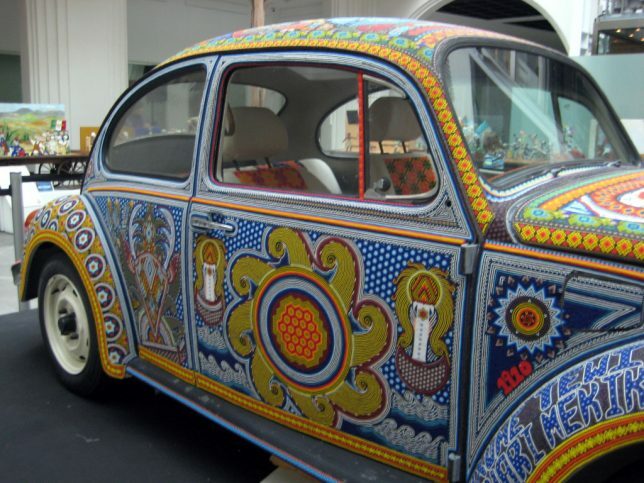 The Volkswagen Type 1 Beetle, one of the 20th century’s most iconic vehicles, also served as a rolling car canvas for artists just itching to bug society. Over 21 million Type 1 Beetles were manufactured between 1938 through 2003, leaving an indelible mark on pop culture’s psyche. VW sought to monetize the classic Bug’s nostalgic appeal through the evocative New Beetle that debuted in 1997, and the subsequent A5 Beetle introduced in 2011. 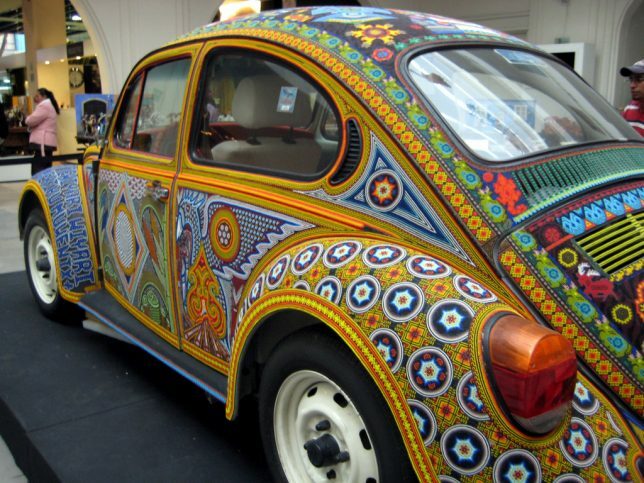 Now that VW has declared the current generation of Beetles to be the last, we can fondly look back to those “true” Bugs immortalized as art cars and transformed into artworks. 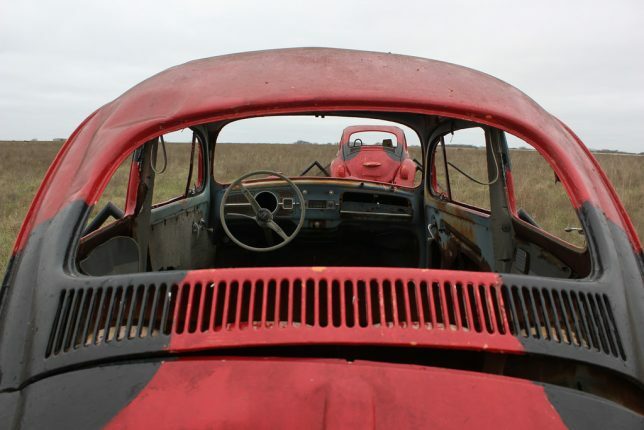 The classic Bug made its last hurrah on July 30th of 2003, when the 21,529,464th and final original Type 1 VW Beetle rolled off the production line in Puebla, Mexico. 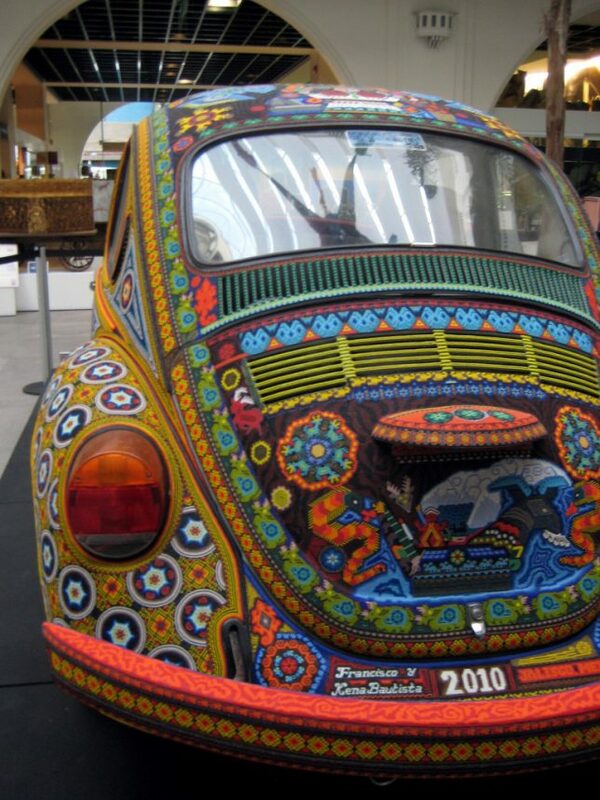 The exquisite Beetle art car above, snapped by Flickr member Angélica Portales (A30_Tsitika) in December 2010, hails from Mexico City. 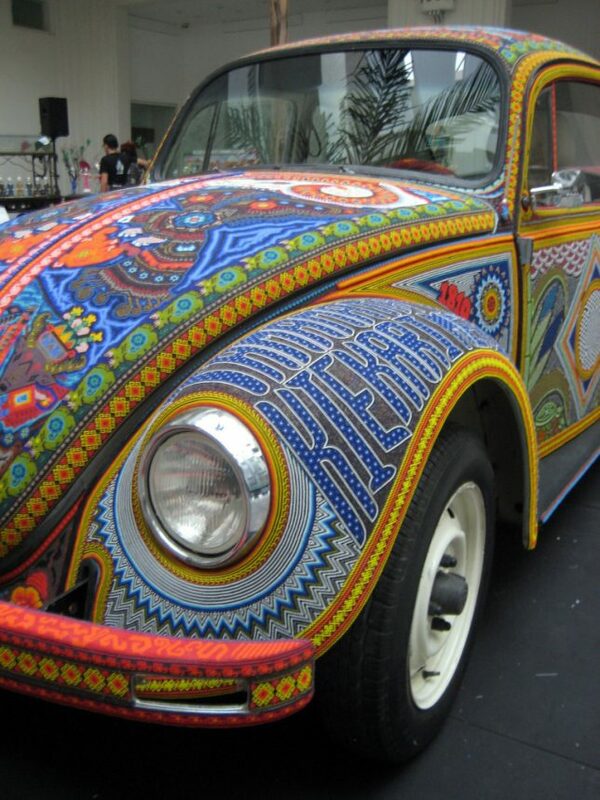 Artists Francisco and Xena Bautista decorated the late-model Bug with tiny seed beads in the traditional Huichol style – a painstaking process that took around 7 months to complete. 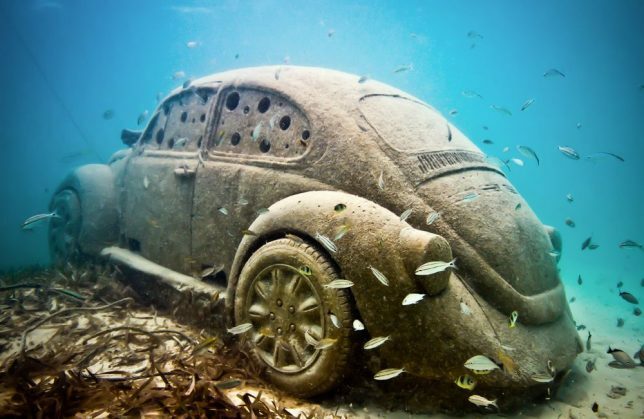 Remember those old DDB magazine ads that featured a floating VW Bug? Well, those don’t apply to this replica Beetle since it’s made of concrete and weighs about 8 tons. 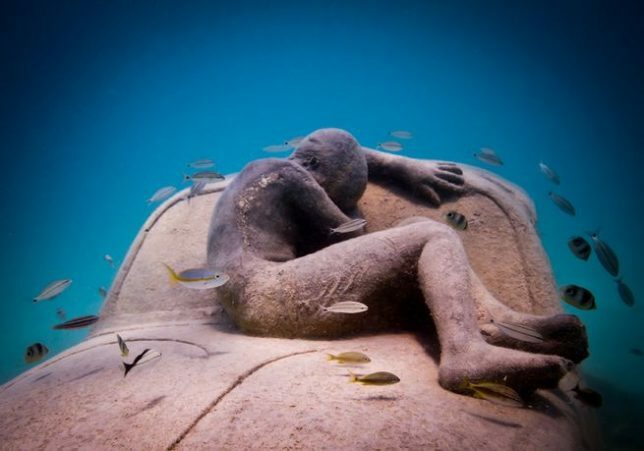 You’ll find it – bring your wetsuit – among the many undersea artworks at the Underwater Museum, off the coast of Cancun, Mexico. 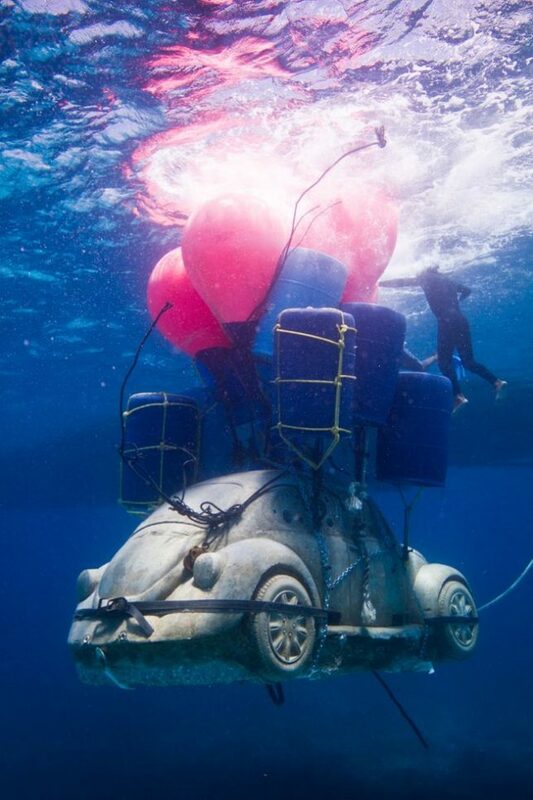 Artist Jason deCaires-Taylor designed the sunken Bug to be sea-life-friendly with pierced windows providing smaller fish with shelter and crustacean habitats accessible via slots under the faux doors. 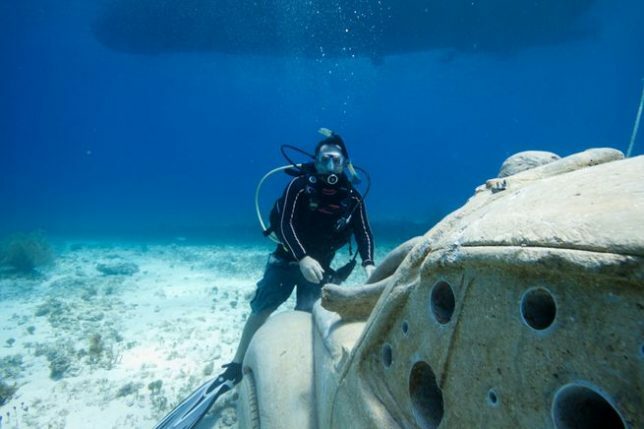 The roughened surfaces are designed to help new coral growths get a grip. While GM’s late and lamented luxo-barges epitomized the American Dream back in the day, the lowly VW Bug was a dream-come-true for countless car-buyers on the lower rungs of the economic ladder. 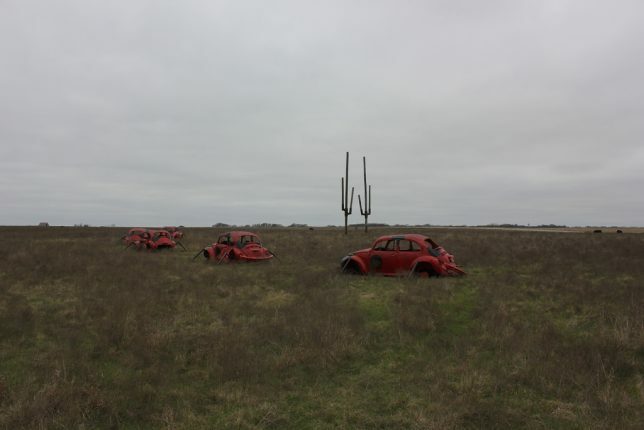 It’s fitting, therefore, that Texas hosts not only the Cadillac Ranch but also a “herd” of five VW Beetles given a ladybug-like makeover. 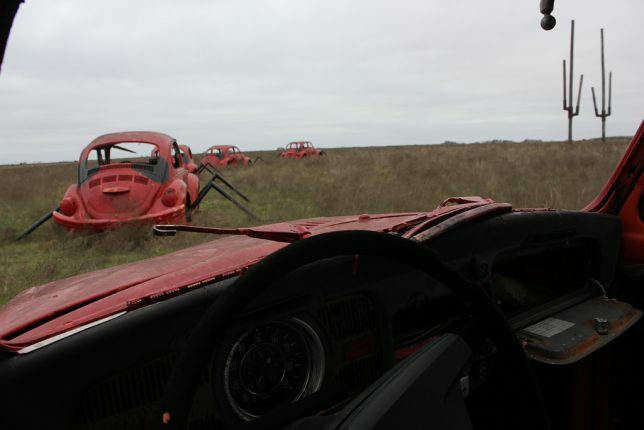 You’ll find this Buggalo-like herd of beetle-y Beetles at the Running N Art Ranch in Saint Jo, Texas, a town of about 1,000 souls in Montague County just south of the Oklahoma border. 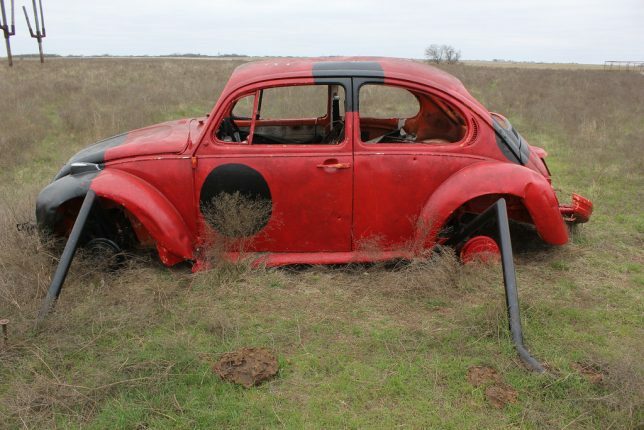 The quintet of decommissioned Bugs sport jointed legs made from old oil field pipes and are painted red with black polka-dots. Unlike the once-stately Caddys sticking out of the ground near Amarillo, these art cars are off-limits to amateur artists. 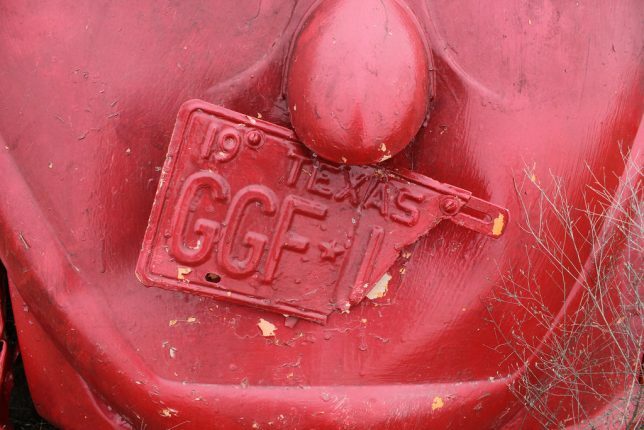 Flickr member Nicholas Henderson (TexasExplorer98) visited the ranch in March of 2017. VW RV FTW: The Amusing & Amazing Beetle MiniHome!